By: Hattie, John (University of Melbourne, Australia), Yates, Gregory C. R.
On publication in 2009 John Hattie's Visible Learning presented the biggest ever collection of research into what actually work in schools to improve children's learning. Not what was fashionable, not what political and educational vested interests wanted to champion, but what actually produced the best results in terms of improving learning and educational outcomes. It became an instant bestseller and was described by the TES as revealing education's `holy grail'. Now in this latest book, John Hattie has joined forces with cognitive psychologist Greg Yates to build on the original data and legacy of the Visible Learning project, showing how it's underlying ideas and the cutting edge of cognitive science can form a powerful and complimentary framework for shaping learning in the classroom and beyond. 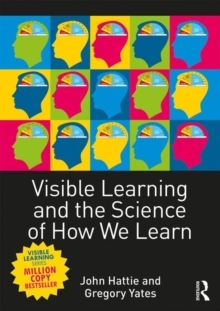 Visible Learning and the Science of How We Learn explains the major principles and strategies of learning, outlining why it can be so hard sometimes, and yet easy on other occasions. Aimed at teachers and students, it is written in an accessible and engaging style and can be read cover to cover, or used on a chapter-by-chapter basis for essay writing or staff development. The book is structured in three parts - `learning within classrooms', `learning foundations', which explains the cognitive building blocks of knowledge acquisition and `know thyself' which explores, confidence and self-knowledge. It also features extensive interactive appendices containing study guide questions to encourage critical thinking, annotated bibliographic entries with recommendations for further reading, links to relevant websites and YouTube clips. Throughout, the authors draw upon the latest international research into how the learning process works and how to maximise impact on students, covering such topics as:teacher personality;expertise and teacher-student relationships;how knowledge is stored and the impact of cognitive load;thinking fast and thinking slow;the psychology of self-control;the role of conversation at school and at home;invisible gorillas and the IKEA effect;digital native theory;myths and fallacies about how people learn. This fascinating book is aimed at any student, teacher or parent requiring an up-to-date commentary on how research into human learning processes can inform our teaching and what goes on in our schools. It takes a broad sweep through findings stemming mainly from social and cognitive psychology and presents them in a useable format for students and teachers at all levels, from preschool to tertiary training institutes.